1960's vintage GILBERT ORCEL draped hat. Light olive green silk shantung. Draped dome crown gathered at center top. 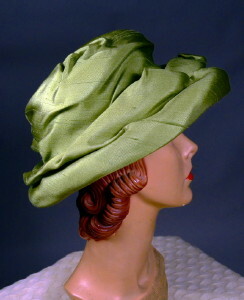 Poufy draped medium brim, darted underside with turn under edge. Fabric is draped over a horsehair hat base. Olive green grosgrain inner band. Ivory acetate lining. Extraordinary 60's chapeaux designed by the fine French Milliner: GILBERT ORCEL. Crown height, front - 4 1/2"
Circumference (measured at inside brim edge) - 23 1/2"